This process describes the making of a simple eccentric with a diameter of 22mm and a throw of 5mm. 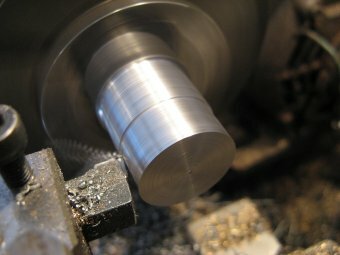 It was machined from a piece of steel bar using just the 3 jaw chuck on the lathe. This process used a packing piece in the 3 jaw chuck which eliminated the need for any 'clocking' or marking out. 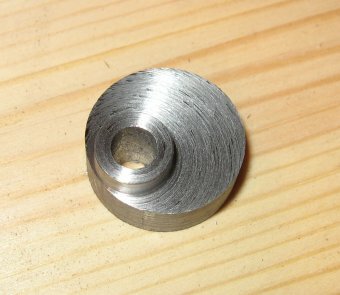 First a piece of bar was turned to the required outside diameter (22mm in this example). The length of bar reduced to this diameter was long enough give the chuck something to grip in the next step. 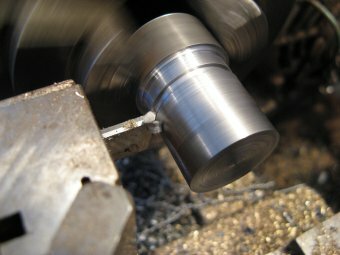 This diameter often forms the working surface of an eccentric so time was taken to get a running fit in the mating part. But the following formula gives a slightly more accurate result whilst not being too complicated. Packing = 1.5 x offset x (1 - (1/8 x (Offset / Bar Diameter))). 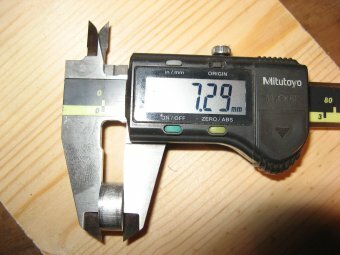 This means that a piece of packing of 7.29mm against one jaw of the 3 jaw chuck should give the required offset of 5mm. 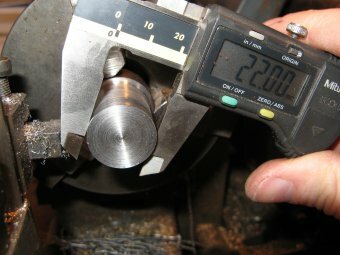 An off-cut of aluminium was turned to a length of 7.29mm. See this document for more information on turning to a specific length. 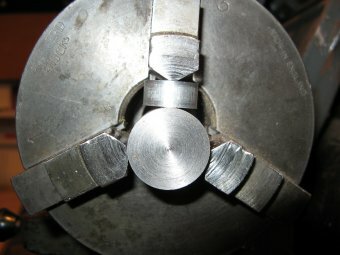 The off-cut was placed between one of the 3 jaw chuck jaws as shown. 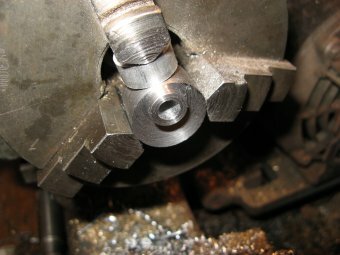 In this setting the hole for the axle was centre drilled, drilled and reamed to size. If required a shoulder concentric with the axle could also be added as shown here. To finish the part was reversed in the chuck and the working surface was finished to final thickness. The eccentric throw was measured on the shadow-graph at work. The distance between the centre of the hole and the centre of the eccentric itself was 5.38mm This is significantly larger than the proposed throw of 5mm but would probably be accurate enough for most purposes. 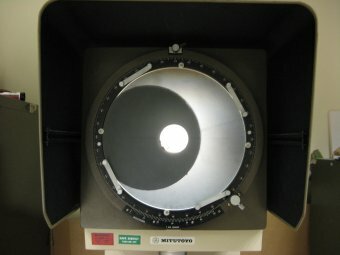 So this technique is a simple method of machining an eccentric, but not highly accurate.